Okay this is my first draft and a flow of thoughts about the changing face of public relations and our need to adapt with the times. I thought I would post a series of comments and thoughts over the next few weeks and see if I can get some feedback and ideas from the group. While I am trying to hold your attention, I will be competing with the buzzing and vibrating – and perhaps, for the mortified few of you, ringing – of your smart phones. Those days, however, are gone. Now, just in the course of the next 20 minutes or so, you may be informed, thanks to Foursquare, that your friend has just landed at JFK. Thanks to Twitter, he will lament his inability to find his bag. You may receive a text message, or perhaps a Tweet, informing you that your own flight home is being delayed and so on and so forth…. Thanks to Facebook, several hundred of your very closest friends will share their forecast for tonight’s basketball game, report their latest accomplishment from pilates class, pontificate on the state of the union, or publish a mildly compromising picture of you from last Saturday night’s festivities at the local pub. And the rest of you will be playing Angry Birds. In short, we are not only connected, we are immersed. And the immersiveness of communications, the intimacy of our relationships with the devices that make it possible – smart phones, tablets, and the like – have become irresistible. The result? Our communications – inbound and outbound, personal and professional – are spinning out of control. And unless we can figure out how to regain at least a little of that control, our careers will spin out of control as well. It’s not only a matter of clutter, or the competition for attention, though certainly that’s a big part of it. The confluence of social media and mobile technology has empowered everyone to be a mass communicator, to do it instantaneously, from any location, at any time, in a wide variety of media. Messages, including those about companies and products, can go “viral” overnight. The impacts range from the trivial to the profound. Protests and revolutions in countries around the world, most recently in Tunisia, have in large part been fueled by this ability. And that means our ability to deliver our messages to their intended recipients, clearly and uncorrupted by the intervention of third parties, has become nearly impossible. But it also creates extraordinary opportunity to establish deeper and more intimate relationships with our customers than we’ve ever had before. Think about this – Nokia lives in the pockets of more than 1.2 billion people around the world. That is the perspective from which I speak today. Whether we seize the opportunities for customer engagement, or continue to let the world spin out of our control, will determine the futures of our organizations and our own careers. • “This ‘telephone’ has too many shortcomings to be seriously considered as a means of communication. The device is inherently of no value to us,” a Western Union memo, circa 1878. • “Television won’t last. It’s a flash in the pan,” Mary Somerville, pioneer of radio educational broadcasts, 1948. 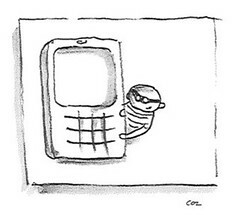 We’ve predicted for the last twenty years that mobile would be a game-changer. But it took a long time to happen at scale. Smart phones – and as much as I hate to say it, especially the iPhone – changed everything. They were cool. They were intuitive. And the apps, the incredible variety of things you could do with the phone, completely changed people’s perception of what a mobile phone is for. At the same time, social media, especially Facebook and Twitter but more recently things like Foursquare, Gowalla and other location-based services, gave people an easy way to use these new devices that is personal, intimate, and in nearly constant use. They transformed each other and created what some people call the biggest change in the way we communicate with each other in at least 50 years, maybe in history.